An advance healthcare directive, also known as living will, personal directive, advance directive, medical directive or advance decision, is a legal document in which a person specifies what actions should be taken for their health if they are no longer able to make decisions for themselves because of illness or incapacity. In the U.S. it has a legal status in itself, whereas in some countries it is legally persuasive without being a legal document. A living will is one form of advance directive, leaving instructions for treatment. Another form is a specific type of power of attorney or health care proxy, in which the person authorizes someone (an agent) to make decisions on their behalf when they are incapacitated. People are often encouraged to complete both documents to provide comprehensive guidance regarding their care, although they may be combined into a single form. An example of combination documents includes the Five Wishes in the United States. The term living will is also the commonly recognised vernacular in many countries, especially the U.K.
Advance directives were created in response to the increasing sophistication and prevalence of medical technology. Numerous studies have documented critical deficits in the medical care of the dying; it has been found to be unnecessarily prolonged, painful, expensive, and emotionally burdensome to both patients and their families. The living will is the oldest form of advance directive. It was first proposed by an Illinois attorney, Luis Kutner, in a law journal in 1969. Kutner drew from existing estate law, by which an individual can control property affairs after death (i.e., when no longer available to speak for himself or herself) and devised a way for an individual to express their health care desires when no longer able to express current healthcare wishes. Because this form of "will" was to be used while an individual was still alive (but no longer able to make decisions) it was dubbed the "living will". In the U.S., The Patient Self-Determination Act (PSDA) went into effect in December 1991, and required healthcare providers (primarily hospitals, nursing homes and home health agencies) to give patients information about their rights to make advance directives under state law. More specific living wills may include information regarding an individual's desire for such services such as analgesia (pain relief), antibiotics, hydration, feeding, and the use of ventilators or cardiopulmonary resuscitation. However, studies have also shown that adults are more likely to complete these documents if they are written in everyday language and less focused on technical treatments. However, by the late 1980s, public advocacy groups became aware that many people remained unaware of advance directives and even fewer actually completed them. In part, this was seen as a failure of health care providers and medical organizations to promote and support the use of these documents. The public’s response was to press for further legislative support. The most recent result was the Patient Self-Determination Act of 1990, which attempted to address this awareness problem by requiring health care institutions to better promote and support the use of advance directives. Living wills proved to be very popular, and by 2007, 41% of Americans had completed a living will. In response to public needs, state legislatures soon passed laws in support of living wills in virtually every state in the union. However, as living wills began to be better recognized, key deficits were soon discovered. Most living wills tended to be limited in scope and often failed to fully address presenting problems and needs. Further, many individuals wrote out their wishes in ways that might conflict with quality medical practice. Ultimately, it was determined that a living will alone might be insufficient to address many important health care decisions. This led to the development of what some have called "second generation" advance directives – the "health care proxy appointment" or "medical power of attorney." Living wills also reflect a moment in time, and may therefore need regular updating to ensure that the correct course of action can be chosen. As before, the next generation advance directive was drawn from existing law – specifically from business law. Power of attorney statutes have existed in the United States since the days of "common law" (i.e., laws brought from England to the United States during the colonial period). These early powers of attorney allowed an individual to name someone to act in their stead. Drawing upon these laws, "durable powers of attorney for health care" and "healthcare proxy appointment" documents were created and codified in law, allowing an individual to appoint someone to make healthcare decisions in their behalf if they should ever be rendered incapable of making their wishes known. The appointed healthcare proxy has, in essence, the same rights to request or refuse treatment that the individual would have if still capable of making and communicating health care decisions. The primary benefit of second-generation advance directives is that the appointed representative can make real-time decisions in actual circumstances, as opposed to advance decisions framed in hypothetical situations, as recorded in a living will. This new advance directive was heartily endorsed by the U.S. public, and supporting legislation soon followed in virtually all states. Eventually, however, deficiencies in "second-generation" advance directives were also soon noted. Primarily, individuals faced problems similar to those that handicapped living wills – knowing what to tell the proxy decision-maker about one's wishes in a meaningful way. Studies found most of what appointed proxies are told is too vague for meaningful interpretation. In the absence of meaningful information, family and physician "guesswork" is found to be inaccurate as much as 76% of the time. While a study comparing next-of-kin decisions on behalf of an incapacitated person, (who later recovered) found that these surrogates chose correctly 68% of the time overall. This continuing problem led to the development of what might be called "third generation" advance directives. Third generation advance directives were designed to contain enriched content to assist individuals and their appointed agents, families, and physicians to better understand and honor their wishes. The first of the third-generation advance directives was the Values History by Doukas and McCullough, created at the Georgetown University School of Medicine, first published in 1988, and then more widely cited in an article in 1991. The Values History is a "two-part advance directive instrument that elicits patient values about terminal medical care and therapy-specific directives." The goal of this advance directive is to move away from a focus on specific treatments and medical procedures to a focus on patient values and personal goals. Another values-based project was later published by Lambert, Gibson, and Nathanson at the Institute of Public Law, University of New Mexico School of Law in 1990. It continues to be made available via the Hospice and Palliative Care Federation. One persistent challenge of third generation-based values documents is to show a linkage between the elicited values and goals with medical care wishes, although studies have demonstrated that values regarding financial and psychological burden are strong motivators in not wanting a broad array of end-of-life therapies. The next widely recognized third generation advance directive is the Medical Directive, created by Emanuel and Emanuel of Massachusetts General Hospital and Harvard Medical School. It is a six-page document that provides six case scenarios for advance medical decision-making. The scenarios are each associated with a roster of commonly considered medical procedures and interventions, allowing the individual to decide in advance which treatments are wanted or not wanted under the circumstances. Several criticisms regarding this advance directive have been expressed. Primarily, it prompts individuals to make medical treatment decisions, which they are typically not equipped to make. Perhaps the best known third-generation advance directive is the Five Wishes directive. This document was developed in collaboration with multiple experts with funding from the Robert Wood Johnson foundation, and is distributed by the organization Aging with Dignity. The document was endorsed by Mother Teresa of the Sisters of Calcutta and by the Chief Justice of the Florida state supreme court. The document meets statutory criteria in 42 states. The most recent third-generation advance directive is the Lifecare Advance Directive. In creating this document, researchers reviewed more than 6,500 articles from medical, legal, sociological, and theological sources. The conclusion was that advance directives needed to be based more on "health outcome states" than on rosters of medical treatments and legal jargon. Building upon the insights gleaned from the literature review, an advance directive document created, tested in a study involving nearly 1,000 participants, and then comparison tested against other popular advance directive forms. The results indicated greater patient/proxy decision-making accuracy, and superior comprehensive content as compared with other documents tested. The primary criticism has been that it is very lengthy and tedious to complete. While some commentators suggest that any recording of one's wishes is problematic, the preponderance of experts recommend the completion of an advance directive document – especially one that includes both a living will and a proxy designation. While most of the public continue to rely upon their state's standard directive format, research demonstrates that many of these documents are too jargon laden and vague, confusing, and incomplete to adequately capture an individual's wishes, and that they focus too much on the needs of medical and legal practitioners to the exclusion of the needs of patients. Advance directive documents are increasingly available online. Some legal commentators have suggested that using a non-statutory advance directive will leave the user with a document that may not be honored. However, legal counsel for the Hastings Center for Bioethics refute this assertion. To make the best choice, individuals should consider reviewing several document styles to ensure that they complete the document that best meets their personal needs. Note: Some of the countries listed below are in the European Union, where legal systems may vary considerably from those in the U.S. Country reports on advance directives is a 2008 paper summarizing advance health care legislation in the European Union with a shorter summary for the U.S.; a 2009 paper also provides a European overview. The laws regarding advance directives, powers of attorney, and enduring guardianships vary from state to state. In Queensland, for example, the concept of an advance health directive is defined in the Powers of attorney act of 1998 and Guardianship and Administration act of 2000. Tasmania has no specific legislation concerning advance healthcare directives. Health Canada – Canada's federal health agency – has acknowledged the need for a greater investment in palliative and hospice care as the country faces a rapidly growing population of elderly and terminally ill citizens. In 2008, The Advance Care Planning in Canada: A National Framework and Implementation Project was founded. The goal was to engage healthcare professionals and educate patients about the importance of advance care planning and end of life care. A 2014 Ipsos Reid Survey reveals that only about a third of Canadian doctors and nurses working in primary care feel comfortable discussing end of life issues with their patients. End-of-life issues in Canada have recently been highlighted due to the ongoing related debate about Physician assisted death in Canada. Former Federal Health Minister Rona Ambrose (July 15, 2013 to November 4, 2015) has stated: "I think the starting point for me is that we still don't have the best elderly care and palliative care yet… So let's talk about making sure we have the best end-of-life care before we start talking about assisted suicide and euthanasia." In England and Wales, people may make an advance directive or appoint a proxy under the Mental Capacity Act 2005. This is only for an advance refusal of treatment for when the person lacks mental capacity; to be legally binding, the advance decision must be specific about the treatment that is being refused and the circumstances in which the refusal will apply. To be valid, the person must have been competent and understood the decision when they signed the directive. Where the patient's advance decision relates to a refusal of life-prolonging treatment this must be recorded in writing and witnessed. Any advance refusal is legally binding providing that the patient is an adult, the patient was competent and properly informed when reaching the decision, it is clearly applicable to the present circumstances and there is no reason to believe that the patient has changed their mind. If an advance decision does not meet these criteria but appears to set out a clear indication of the patient's wishes, it will not be legally binding but should be taken into consideration in determining the patient's best interests. In June 2010, the Wealth Management Solicitors, Moore Blatch, announced that research showed demand for Living Wills had trebled in the two years previous, indicating the rising level of people concerned about the way in which their terminal illness will be managed. According to the British Government, every adult with mental capacity has the right to agree to or refuse medical treatment. In order to make their advance wishes clear, people can use a living will, which can include general statements about wishes, which are not legally binding, and specific refusals of treatment called "advance decisions" or "advance directives". On 18 June 2009 the Bundestag passed a law on advance directives, applicable since 1 September 2009. Such law, based on the principle of the right of self-determination, provides for the assistance of a fiduciary and of the physician. On 14 December 2017, Italian Senate officially approved a law on advance healthcare directive that came into force on 31 January 2018. Controversy over end-of-life care emerged in Italy in 2006, when a terminally ill patient suffering from muscular dystrophy, Piergiorgio Welby, petitioned the courts for removal of his respirator. Debated in Parliament, no decision was reached. A doctor eventually honored Welby's wishes by removing the respirator under sedation. The physician was initially charged for violating Italy's laws against euthanasia, but was later cleared. Further debate ensued after the father of a 38-year-old woman, Eluana Englaro, petitioned the courts for permission to withdraw feeding tubes to allow her to die. Englaro had been in a coma for 17 years, following a car accident. After petitioning the courts for 10 years, authorization was granted and Englaro died in February 2009. In May 2008, apparently as a result of the recent Court of Cassation's holding in the case of Englaro, a guardianship judge in Modena, Italy used relatively new legislation to work around the lack of the advance directive legislation. The new law permitted a judicially appointed guardian ("amministratore di sostegno") to make decisions for an individual. Faced with a 70-year-old woman with end-stage Lou Gehrig's Disease who was petitioning the court (with the support of her family) to prevent any later use of a respirator, the judge appointed her husband as guardian with the specific duty to refuse any tracheotomy and/or respirator use if/when the patient became unable to refuse such treatment herself. In the Netherlands, patients and potential patients can specify the circumstances under which they would want euthanasia for themselves. They do this by providing a written euthanasia directive. This helps establish the previously expressed wish of the patient even if the patient is no longer able to communicate. However, it is only one of the factors that is taken into account. Apart from the will in writing of the patients, at least two physicians, the second being totally unrelated to the first physician in a professional matter (e.g. working in another hospital, no prior knowledge of the medical case at hand), have to agree that the patient is terminally ill and that no hope for recovery exists. 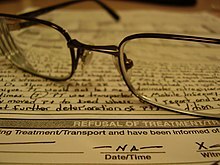 In Switzerland, there are several organizations which take care of registering patient decrees, forms which are signed by the patients declaring that in case of permanent loss of judgement (e.g., inability to communicate or severe brain damage) all means of prolonging life shall be stopped. Family members and these organizations also keep proxies which entitle their holder to enforce such patient decrees. Establishing such decrees is relatively uncomplicated. However, in Switzerland, a patient decree has, as of November 2008, no legally binding effects, whether concerning civil or criminal aspects. Such a decree is today merely viewed as representing the supposed will of the person with the incapability. There is, however, a revision of the Swiss Civil Code under way that aims to change this situation (intended to be article 360 of the Swiss Civil Code) by making the patient decree a legally binding document. Aggressive medical intervention leaves nearly two million Americans confined to nursing homes, and over 1.4 million Americans remain so medically frail as to survive only through the use of feeding tubes. Of U.S. deaths, 25–55% occur in health care facilities. As many as 30,000 persons are kept alive in comatose and permanently vegetative states. Cost burdens to individuals and families are considerable. A national study found that: “In 20% of cases, a family member had to quit work;” 31% lost “all or most savings” (even though 96% had insurance); and “20% reported loss of [their] major source of income.” Yet, studies indicate that 70-95% of people would rather refuse aggressive medical treatment than have their lives medically prolonged in incompetent or other poor prognosis states. As more and more Americans experienced the burdens and diminishing benefits of invasive and aggressive medical treatment in poor prognosis states – either directly (themselves) or through a loved one – pressure began to mount to devise ways to avoid the suffering and costs associated with treatments one did not want in personally untenable situations. The first formal response was the living will. In the United States, all states recognize some form of living wills or the designation of a health care proxy. The term living will is not officially recognized under California law, but an advance health care directive or durable power of attorney may be used for the same purpose as a living will. A "report card" issued by the Robert Wood Johnson Foundation in 2002 concluded that only seven states deserved an "A" for meeting the standards of the model Uniform Rights of the Terminally Ill Act. Surveys show that one-third of Americans say they have had to make decisions about end-of-life care for a loved one. In Pennsylvania on November 30, 2006, Governor Edward Rendell signed into law Act 169, that provides a comprehensive statutory framework governing advance health care directives and health care decision-making for incompetent patients. As a result, health care organizations make available a "Combined Living Will & Health Care Power of Attorney Example Form from Pennsylvania Act 169 of 2006." Several states offer living will "registries" where citizens can file their living will so that they are more easily and readily accessible by doctors and other health care providers. However, in recent years some of these registries, such as the one run by the Washington State Department of Health, have been shuttered by the state government because of low enrollment, lack of funds, or both. On July 28, 2009, Barack Obama became the first United States President to announce publicly that he had a living will, and to encourage others to do the same. He told an AARP town meeting, "So I actually think it's a good idea to have a living will. I'd encourage everybody to get one. I have one; Michelle has one. And we hope we don't have to use it for a long time, but I think it's something that is sensible." The announcement followed controversy surrounding proposed health care legislation that included language that would permit the payment of doctors under Medicare to counsel patients regarding living wills, sometimes referred to as the "infamous" page 425. Shortly afterwards, bioethicist Jacob Appel issued a call to make living wills mandatory. Indian Supreme Court on March 9, 2018 permitted living wills and passive euthanasia. The country's apex court held that the right to a dignified life extends up to the point of having a dignified death. ^ Larson, Aaron. "How a Power of Attorney Works". ExpertLaw.com. ExpertLaw. Retrieved 4 May 2017. ^ Childress, J. Dying Patients. Who's in Control? Law, Medicine & Health Care. 1989;17(3):227-228. ^ SUPPORT Investigators. A controlled trial to improve care for seriously ill hospitalized patients: the Study to Understand Prognoses and Preferences for Outcomes and Risks of Treatments (SUPPORT). Journal of the American Medical Association. 1995;274(20):1591-1598. ^ Lubitz, J; Riley, GF. Trends in Medicare payments in the last year of life. New England Journal of Medicine. 1993;328:1092-1096. ^ Scitovsky, A.A. The High Cost of Dying, Revisited. Milbank Quarterly. 1994;72(4):561-591. ^ American Medical Association. Guidelines for the Appropriate Use of Do-Not-Resuscitate Orders. Council on Ethical and Judicial Affairs. Journal of the American Medical Association. 1991;265(14):1868-1871. ^ McGrath, RB. In-house Cardiopulmonary resuscitation -- after a quarter of a century. Annals of Emergency Medicine. 1987;16:1365-1368. ^ Kutner, Luis (1969). "Due Process of Euthanasia: The Living Will, a Proposal". Indiana Law Journal. 44 (4): 534–554. Retrieved 22 March 2018. ^ Alexander G.J. (1991). "Time for a new law on health care advance directives". Hastings Center Law Journal. 42 (3): 755–778. ^ Patient Self-Determination Act U.S.C.A. 1395cc & 1396a, 4206-4207, 4751, Omnibus Budget Reconciliation Act of 1990, P.L:.b 101-508 (101ST Cong. 2nd Sess. Nov. 5, 1990) (West Supp., 1991). ^ Docker, C. Advance Directives/Living Wills in: McLean S.A.M., Contemporary Issues in Law, Medicine and Ethics," Dartmouth 1996:182. ^ Tokar, Steve. "Patients Prefer Simplified Advance Directive over Standard Form - UCSF Today". Pub.ucsf.edu. Archived from the original on 2009-02-07. Retrieved 2010-06-23. ^ Damato AN (1993). "Advance Directives for the Elderly: A Survey". New Jersey Medicine. 90 (3): 215–220. ^ Anthony, J. Your aging parents: document their wishes. American Health. May 1995. pp. 58-61, 109. ^ Cugliari A, Miller T, Sobal J (1995). "Factors promoting completion of advance directives in the hospital". Archives of Internal Medicine. 155 (9): 1893–1898. doi:10.1001/archinte.155.17.1893. ^ Johnston SC; et al. (1995). "The discussion about advance directives: patient and physician opinions regarding when and how it should be conducted". Archives of Internal Medicine. 155 (10): 1025–1030. doi:10.1001/archinte.155.10.1025. ^ Omnibus Reconciliation Act of 1990 [including amendments commonly known as The Patient Self-Determination Act]. Sections 4206 and 4751, P.L. 101-508. Introduced as S. 1766 by Senators Danforth and Moynihan, and HR 5067 by Congressman Sander Levin. Signed by the President on November 5, 1990; effective beginning December 1, 1991. ^ a b American Bar Association. Patient Self-Determination Act: State Law Guide. American Bar Association Commission on Legal Problems of The Elder. August 1991. ^ Omnibus Reconciliation Act of 1990. ^ Charmaine Jones, With living wills gaining in popularity, push grows for more extensive directive, Crain's Cleveland Business, August 20, 2007. ^ a b c Annas GJ (1991). "The Health Care Proxy and the Living Will". New England Journal of Medicine. 324 (17): 1210–1213. doi:10.1056/nejm199104253241711. ^ Hashimoto DM (1983). "A structural analysis of the physician-patient relationship in no-code decision-making". Yale Law Journal. 93 (2): 362–383. doi:10.2307/796311. JSTOR 796311. ^ Hastings Center. Guidelines on the Termination of Life-Sustaining Treatment and the Care of the Dying: a report by the Hastings Center. Briarcliff Manor, NY: Indiana University Press. 1987. ^ Campbell ML (1995). "Interpretation of an ambiguous advance directive". Dimensions of Critical Care Nursing. 14 (5): 226–235. doi:10.1097/00003465-199509000-00001. ^ "Common law | Define Common law at Dictionary.com". Dictionary.reference.com. Retrieved 2010-06-23. ^ a b c American Bar Association. Patient Self-Determination Act: State Law Guide. American Bar Association Commission on Legal Problems of the Elderly. August 1991. ^ Cohen-Mansfield J; et al. (1991). "The decision to execute a durable power of attorney for health care and preferences regarding the utilization of life-sustaining treatments in nursing home residents". Archives of Internal Medicine. 151 (2): 289–294. doi:10.1001/archinte.151.2.289. ^ a b c Emanuel LL, Emanuel EJ (1993). "Decisions at the end of life: guided by communities of patients". Hastings Center Report. 23 (5): 6–14. doi:10.2307/3562059. JSTOR 3562059. ^ Emanuel LL, Emanuel EJ (1993). "Advance directives: what have we learned so far?". Journal of Clinical Ethics. 4: 8–16. ^ High , Turner HB (1987). "Surrogate decision-making: the elderly's familial expectations". Theoretical Medicine. 8 (3): 303–320. doi:10.1007/bf00489466. ^ High DM (1988). "All in the family: extended autonomy and expectations in surrogate health care decision-making". Gerontologist. 28 (Suppl): S46–S51. doi:10.1093/geront/28.suppl.46. ^ Diamond E; et al. (1989). "Decision-making ability and advance directive preferences in nursing home patients and proxies". Gerontologist. 29 (5): 622–26. doi:10.1093/geront/29.5.622. ^ Hare J; et al. (1992). "Agreement between patients and their self-selected surrogates on difficult medical decisions". Archives of Internal Medicine. 152 (5): 1049–54. doi:10.1001/archinte.1992.00400170123023. ^ Ouslander, J et al. "Health care decisions made by frail elderly and their potential proxies. Gerontologist 1988; 28:103A-104A. ^ Seckler AB, Meier DE, Mulvihill M, Cammer Paris BE (1991). "Substituted judgment: how accurate are proxy predictions?". Annals of Internal Medicine. 115 (2): 92–98. doi:10.7326/0003-4819-115-2-92. ^ Tomlinson T, Howe K, Notman M, Rossmiller D (1990). "An empirical study of proxy consent for elderly persons". Gerontologist. 30: 54–61. doi:10.1093/geront/30.1.54. ^ Uhlmann R, Pearlman R, Cain K (1989). "Understanding elderly patients' resuscitation preferences by physicians and nurses". Western Journal of Medicine. 150: 705–44. ^ Zweibel NR, Cassel CK (1989). "Treatment choices at the end of life: a comparison of decisions by older patients and their physician-selected proxies". Gerontologist. 29 (5): 615–21. doi:10.1093/geront/29.5.615. PMID 2599421. ^ Shalowitz, David I.; Garrett-Mayer, Elizabeth; Wendler, David (2006). "The Accuracy of Surrogate Decision Makers: A Systematic Review". Archives of Internal Medicine. 166 (5): 493. doi:10.1001/archinte.166.5.493. Conclusions Patient-designated and next-of-kin surrogates incorrectly predict patients' end-of-life treatment pREFERENCES in one third of cases. ^ Doukas DJ, McCullough LB, "Assessing the Values History of the Aged Patient Regarding Critical and Chronic Care," in The Handbook of Geriatric Assessment. Eds. Gallo JJ, Reichel W, Andersen LM, Rockville, MD: Aspen Press, 1988:111-124. ^ Doukas DJ, McCullough LB (1991). "The values history: the evaluation of the patient's values and advance directives". Journal of Family Practice. 32: 145–53. ^ "Values History Form". Hospicefed.org. Retrieved 2010-06-23. ^ "Values History". Hospicefed.org. Archived from the original on 2012-12-13. Retrieved 2014-03-08. ^ Eisendrath S, Jonsen A (1983). "The living will – help or hindrance?". Journal of the American Medical Association. 249 (15): 2054–58. doi:10.1001/jama.249.15.2054. ^ Emanuel LL, Emanuel E (1989). "The medical directive: A new comprehensive advance care document". Journal of the American Medical Association. 261 (22): 3288–93. doi:10.1001/jama.261.22.3288. ^ a b Sachs GA, Cassell CK (1990). "The medical directive". Journal of the American Medical Association. 267 (16): 2229–33. doi:10.1001/jama.267.16.2229. ^ a b c Brett AS (1991). "Limitations of listing specific medical interventions in advance directives". Journal of the American Medical Association. 266 (6): 825–28. doi:10.1001/jama.266.6.825. ^ a b c Silverman H, Vinicky J, Gasner M (1992). "Advance directives: implications for critical care". Critical Care Medicine. 20 (7): 1027–1031. doi:10.1097/00003246-199207000-00021. ^ a b "Aging With Dignity Five Wishes". Agingwithdignity.org. Archived from the original on 2009-05-09. Retrieved 2010-06-23. ^ "The Robert Wood Johnson Foundation: Health and Health Care Improvement". RWJF. Archived from the original on 22 June 2010. Retrieved 2010-06-23. ^ Lynn J (1991). "Why I don't have a living will". Law, Medicine & Health Care. 19 (1–2): 101–04. doi:10.1111/j.1748-720x.1991.tb01803.x. ^ Annas George J (1991). "The Health Care Proxy and the Living Will". New England Journal of Medicine. 324 (17): 1210–1213. doi:10.1056/nejm199104253241711. ^ Bok S (1976). "Personal directions for care at the end of life". New England Journal of Medicine. 295 (7): 367–369. doi:10.1056/nejm197608122950706. ^ Colin, BD. Living Choice. Health. November 1986. p. 72. ^ Colvin ER, Hammes BJ (1991). "If only I knew: a patient education program on advance directives". American Nephrology Nurses Association Journal. 18 (6): 557–560. ^ Ewer MS, Taubert JK (1995). "Advance directives in the intensive care unit of a tertiary cancer center". Cancer. 76 (7): 1268–74. doi:10.1002/1097-0142(19951001)76:7<1268::aid-cncr2820760726>3.0.co;2-u. PMID 8630908. ^ Joos SK, Reuler JB, Powell JL, Hickam DH (1993). "Outpatients' attitudes and understanding regarding living wills". Journal of General Internal Medicine. 8 (5): 259–63. doi:10.1007/bf02600093. ^ Schneiderman LJ; et al. (1992). "Relationship of general advance directive instructions to specific life-sustaining treatment preferences in patients with serious illness". Archives of Internal Medicine. 152 (10): 2114–22. doi:10.1001/archinte.152.10.2114. ^ Gamble ER; et al. (1991). "Knowledge, attitudes and behavior of elderly persons regarding living wills". Archives of Internal Medicine. 151 (2): 277–80. doi:10.1001/archinte.1991.00400020049011. ^ Tyminski MO (2005). "The current state of advance directive law in Ohio: more protective of provider liability than patient rights". Journal of Law and Health. 19 (2): 411–49. ^ Ki Mae Heussner (2013-06-29). "Easing the end of life: Startups that are helping people make the ultimate decision". gigaom.com. ^ "Bioethics and Public Policy". The Hastings Center. Archived from the original on 7 July 2010. Retrieved 2010-06-23. ^ Wolf SM (1991). "Honoring broader directives". Hastings Center Report. 21 (5): S8–S9. doi:10.2307/3562902. JSTOR 3562902. ^ "Country reports on advance directives, 100 pages" (PDF). University of Zurich. Retrieved 2017-02-11. ^ Andorno, Roberto. "Advance Health Care Directives: Towards a Coordinated European Policy?". academia.edu. ^ Rothschild, Alan (5 Feb 2008). "Physician-Assisted Death. An Australian Perspective". In Birnbacher, Dieter; Dahl, Edgar. Giving Death a Helping Hand: Physician-Assisted Suicide and Public Policy. An International Perspective. International Library of Ethics, Law, and the New Medicine. 38. Springer. p. 104. ISBN 9781402064951. ^ "Health Canada- Minister's speeches". Health Canada.ca. 2014-02-06. Archived from the original on 2014-11-29. Retrieved 2014-11-18. ^ "Canadian Hospice Palliative Care Association". CHPCA.net. 2014. Retrieved 2014-11-18. ^ "The Way Forward". HPC integration.ca. 2014. Retrieved 2014-11-18. ^ "The CARENET". The CARENET.ca. 2014. Retrieved 2014-11-18. ^ "Pallium Canada". Pallium.ca. 2014. Retrieved 2014-11-18. ^ "National Framework for advance care planning". SpeakUp. 2014. Archived from the original on 2014-11-28. Retrieved 2014-11-18. ^ "The Way Forward: an Integrated Approach to Palliative Care" (PDF). HPC integration. 2014. Retrieved 2014-11-18. ^ "The Way Forward- moving towards an integrated palliative approach to care: survey of GP/FPs and nurses in primary care" (PDF). Ipsos Reid. August 2014. Retrieved 2014-11-18. ^ "Rona Ambrose says Canada needs better palliative care". CBC. 2014-09-15. Retrieved 2014-11-18. ^ "BMA guidance" (PDF). bma.org.uk. ^ Johnston, Carolyn; Liddle, Jane (2007). "The Mental Capacity Act 2005: a new framework for healthcare decision making". Journal of Medical Ethics. 33 (2): 94–97. doi:10.1136/jme.2006.016972. PMC 2598235. PMID 17264196. ^ LONDON (June 10, 2010) (2010-06-10). "Demand for Living Wills trebles in the last two years". JLNS. Archived from the original on 17 July 2010. Retrieved 2010-06-23. ^ For the official guidance to doctors, see: "Treatment and care towards the end of life: good practice in decision making". General Medical Council, 2010. Although addressed to doctors, the guidance may also provide helpful information to patients and the public; see, . Retrieved 2011-01-05. ^ "How to make a living will : Directgov - Government, citizens and rights". Direct.gov.uk. Archived from the original on 2009-07-18. Retrieved 2010-06-23. ^ "*** NORMATTIVA ***". www.normattiva.it. ^ "Biotestamento. Favorevole o contrario?". ProVersi.it. 19 February 2018. ^ Fisher, Ian (21 December 2006). "Euthanasia Advocate in Italy Dies". New York Times. Retrieved 23 November 2017. ^ Owen, Richard (10 February 2009). "'Right to die' coma woman Eluana Englaro dies". The Times. Retrieved 23 November 2017. ^ Decree of Dr. Guido Stanziani, Guardianship Judge of the Tribunal of Modena, 13 May 2008. ^ "Site of the Swiss government on the intended new law". Ejpd.admin.ch. Archived from the original on 2010-06-07. Retrieved 2010-06-23. ^ Wilkkes, JL. Nursing Home Nightmares. USAToday. August 20, 1996. 11A. ^ a b US Congress, Office of Technology Assessment. Life-Sustaining Technologies and the Elderly. OTA-BA-306. Washington, DC: US Gov't Printing Office. July, 1987. ^ Current TV: News Video Clips & Current News Articles "A Third of Americans Die in Hospitals, Study Finds" September 24, 2010. ^ American Academy of Neurology. Practice Parameters: Assessment and Management of Patients in the Persistent Vegetative State: Summary Statement. Neurology. 1995;45(5):1015-1018. ^ Covinsky, KE; Goldman, L; Cook, EF; etal. The impact of serious illness on patient's families. Journal of the American Medical Association. 1994;272(23):1839-1844. ^ Heap, MJ; etal. Elderly patients' preferences concerning life support treatment. Anaesthesia. 1993;48:1027-1033. ^ Patrick, DL; etal. Measuring preferences for health states worse than death. Medical Decision-Making. 1994;14:9-19. ^ "Living Wills, Health Care Proxies, & Advance Health Care Directives". ABA. American Bar Association. Retrieved 8 May 2017. ^ "Do I Need a Will?". State Bar of California. Retrieved 23 November 2017. ^ "Means to a Better End: A Report on Dying in America Today" (PDF). Robert Wood Johnson Foundation. November 2002. Archived from the original (PDF) on 7 September 2008. Retrieved 23 November 2017. ^ "One-third of Americans say they've had to make a decision about whether to keep a loved one alive using extraordinary means". Public Agenda. Archived from the original on 27 April 2009. Retrieved 17 June 2010. ^ "Facts on Act 169 (Advance Directives) - Pennsylvania Medical Society". Pamedsoc.org. Archived from the original on 2011-05-07. Retrieved 2010-06-23. ^ "Washington state ends living will registry". The Seattle Times. July 1, 2011. Archived from the original on September 27, 2013. Retrieved 2011-07-24. ^ Conolly, Ceci. "Obama takes personal approach in AARP speech," The Washington Post, July 29, 2009. ^ President Obama Holds a Tele-Townhall Meeting on Health Care with AARP Members, CQ Transcriptions, July 28, 2009. ^ Appel Jacob M (2010). "When Any Answer is a Good Answer: A Mandated Choice Model for Advance Directives". Cambridge Quarterly of Healthcare Ethics. 19 (3): 417–422. doi:10.1017/s0963180110000253. PMID 20507692. ^ "Death with dignity: on SC's verdict on euthanasia and living wills". The Hindu. 10 March 2018 – via www.thehindu.com. World Collaboratory on Advance Directives. Andalusian School of Public Health. Spain.